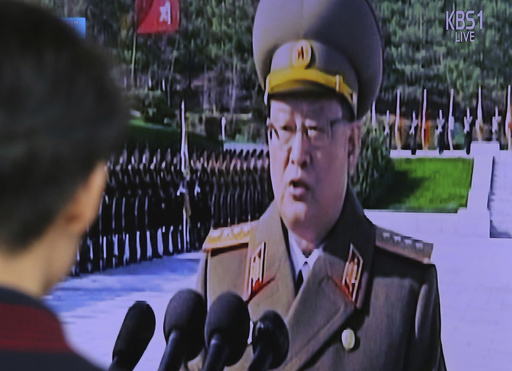 SEOUL, South Korea (AP) — North Korea executed five senior security officials with anti-aircraft guns because they made false reports that “enraged” leader Kim Jong Un, South Korea’s spy agency said Monday. The comments by the National Intelligence Service in a private briefing to lawmakers come as Malaysia investigates the poisoning death of Kim’s estranged elder half brother, Kim Jong Nam. That investigation is still going on, but South Korea says it believes Kim Jong Un ordered the assassination, which took place Feb. 13 at Kuala Lumpur’s airport. The spy agency told lawmakers that five North Korean officials in the department of recently purged state security chief Kim Won Hong were executed by anti-aircraft guns because of the false reports to Kim, South Korean lawmaker Lee Cheol Woo said. It’s not clear what false reports they allegedly made, and the NIS didn’t say how it got its information. Lee also cited the NIS as saying that Kim Won Hong’s dismissal was linked to those false reports, which “enraged” Kim Jong Un when they were discovered.